Hi everyone! Well school is back in session and summer is officially over (for us teachers at least). Tell that to the weather! The past week or so it’s been in the 80s and 90s and it has not been fun for those of us without air conditioning in our classrooms. It is definitely not an ideal condition for teaching/learning. I am looking forward to the arrival of Fall and the cooler weather that comes along with it. Not to mention that Fall is my favorite season! Can’t wait! A few weeks ago I was watching “Giada at Home” and she made these delectable looking chicken tenders and I was eager to try them out at home. She has a way of making everything look so easy and delicious so I always end up pinning a ton of her recipes on Pinterest. This recipe did not disappoint. It was just as easy as it looked and tasted great! My only advice is to make these in a non-stick pan. I tried my first batch in a stainless steel skillet and the breadcrumbs were getting stuck to the bottom. My Teflon and ceramic pans worked great though! Begin the Crispy Chicken Tenders by preparing the breading. 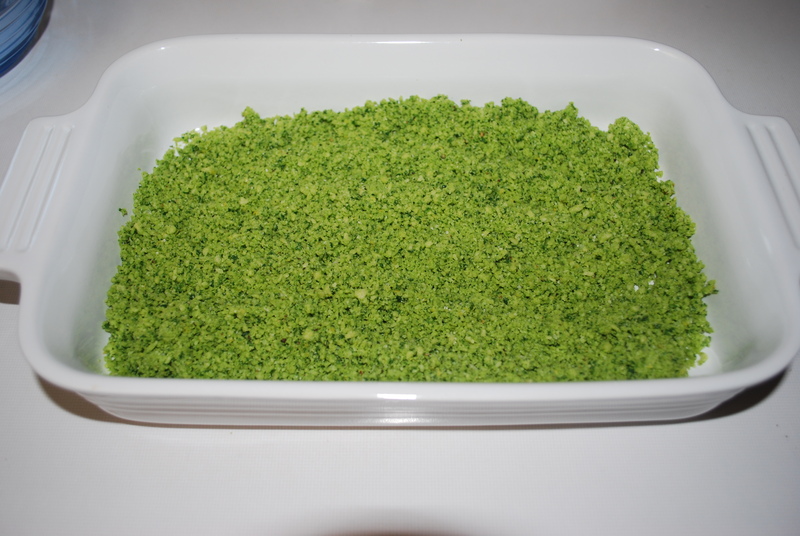 Combine 3/4 cup panko bread crumbs, 1/2 packed cup fresh spinach, 1/2 cup grated parmesan, the zest of 1 large lemon, 3/4 teaspoon kosher salt, and 1/4 teaspoon freshly ground black pepper in a food processor. Blend until the spinach becomes very fine, then transfer to a bowl. Next, prepare your chicken by patting dry 1 pound chicken tenders and cutting them into 2 inch pieces. In a different bowl than the breading mixture, pour in 3/4 cup buttermilk and place the chicken pieces into the buttermilk. Use a slotted spoon or tongs to transfer the chicken into the breading mixture and toss until the chicken is coated with the breadcrumbs. I loved that they were green! Heat 3/4 cup vegetable oil in a non-stick skillet over medium-high heat. When oil is hot, add 1/3 of the chicken and fry until crisp and golden (about 3 minutes per side). Remove chicken tenders onto a paper towel-lined plate and repeat with the remaining chicken tenders. We served these with ketchup, barbecue sauce, and honey mustard but Giada also provided the recipe for a Piccata sauce. 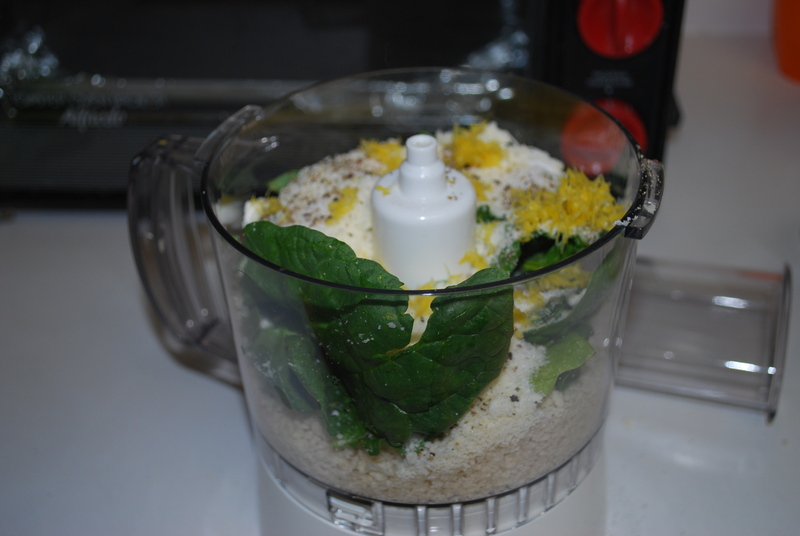 For breading: combine panko bread crumbs, spinach, parmesan, lemon zest, kosher salt, and freshly ground black pepper in a food processor. 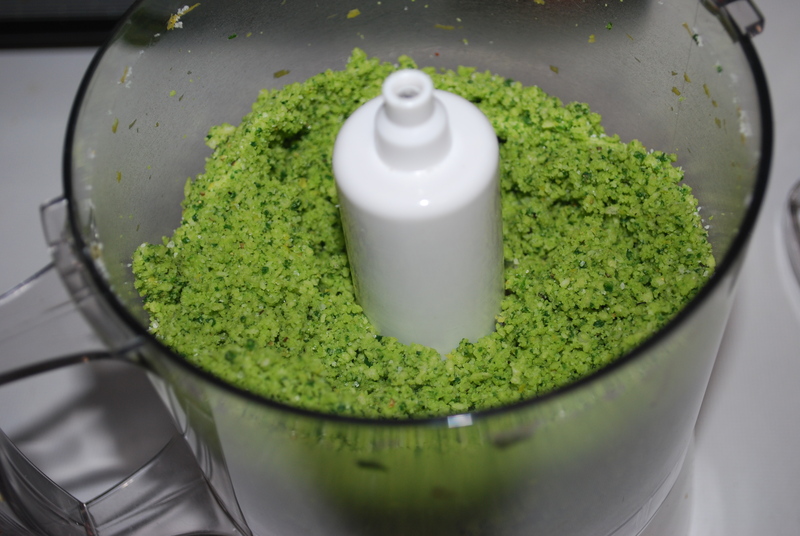 Blend until the spinach becomes very fine, then transfer to a bowl. In a different bowl, pour in buttermilk and place the chicken pieces into the buttermilk. Use a slotted spoon or tongs to transfer the chicken into the breading mixture and toss until the chicken is coated with the breadcrumbs. Heat vegetable oil in a non-stick skillet over medium-high heat. When oil is hot, add 1/3 of the chicken and fry until crisp and golden (about 3 minutes per side). Remove chicken tenders onto a paper towel-lined plate and repeat with the remaining chicken tenders. These chicken tenders turned out to be a big hit. I loved the tangy flavor of the lemon zest and parmesan cheese and crunchy texture of the panko breadcrumbs. I hope you’ll give this recipe a try! This entry was posted in Dinner, Lunch, Uncategorized and tagged buttermilk, chicken fingers, crispy, panko breadcrumbs, parmesan, spinach. Bookmark the permalink. Hi Nicole, thanks for recommending cookware with Teflon® nonstick coatings while making your Crispy Chicken Tenders recipe! I represent DuPont and it’s always a pleasure to see people recommending our products in their recipes.